The Victory Players triumphed in two quite different plays last month: each concerned, in their own way, with anticipating the futures of the characters. First, though, in grateful memory of Paul Scofield, the evening began with his recorded performance of Wilfred Owen's war poem "Futility", which he had read at the Players' debut performance of "Oh What a Lovely War". 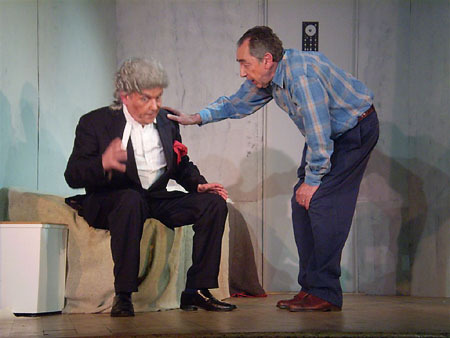 The first play, The Dock Brief, was a humorous, tender and sympathetic interplay between an elderly and incompetent barrister Morgenhall (Douglas Wragg) and his simple and doleful client, the prisoner Mr Fowle (Chris Walker) accused of murdering his wayward wife. Both actors were extremely gifted and well matched, with their outlooks and personalities subtly changing into a reversal of roles and growing mutual affection. The barrister, at first full of bombast and confidence, rather despising his ignorant client, but ending in despair at his failure to secure a not guilty verdict; the prisoner, convinced that he is guilty anyway, and with a deliciously woebegone face to match, is at first deferential to his clever barrister, but ends up feeling very sorry for him when the guilty verdict is announced. The joke is that the verdict is then overruled because the court declared that the prisoner had not been properly represented by his barrister. While Morgenhall sinks into despair, Fowle comforts him with the thought that he has actually been very successful. It was because of his incompetence that he had been found not guilty! The small set was used imaginatively. The characters pacing around, facing each other, sitting on the bed or wc pan. The prisoner himself imitating various individuals from fictitious witnesses to the judge in charge of the case. All very droll. Impossible to convey the cleverness of the script. But not difficult to admire the actors' command of the words. At the end, the prisoner is released and the barrister agrees that "the future is not so bad". Both actors were outstanding. But was the play perhaps just a touch too long? The second play, Waiting Room, was a hoot! 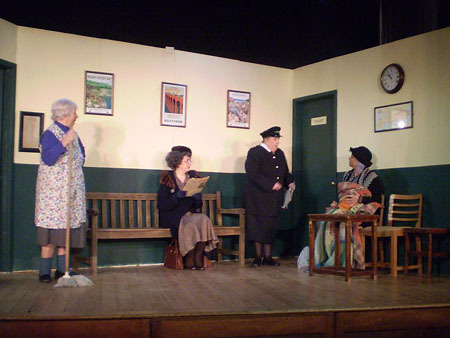 The action takes place in a railway waiting room where Shirley Michell (the cleaner) sings in a loud cracked voice, waking up the resident bag lady (Nancy Towers) who comments rudely throughout the action and consistently refuses to be thrown out, despite the best efforts of a splendidly bossy BR official (Val Horton). Enter, a very posh spinster Miss March (Jane Horrell) who irritatingly knows everything, but is later proved right. Now comes the romantic twist with the entrance of demure young Jane smith (Natalie Wheaton) unfortunately in love with a married man. They all strive to give her conflicting advice, including another posh arrival Mrs Ogilvy (Nicola Preston-Bell). A wonderfully tweedy lady Miss Gossage (Helen Sweetman) leaves her barking dog outside and spends the rest of the time munching sandwiches and saying little. Quite a difficult role, yet, somehow you were always aware she was there. Then, in bursts Jane's furious mother, stridently played by Jacqueline Wiginton, ordering her rebellious daughter home. And not to forget the tea lady (Isobel Gordon) who twice refuses to serve any tea because the time is wrong. Anyway, it emerges (as though we hadn't worked it out for ourselves) that the married man Jane is after is actually Mrs Ogilvy's husband, who are both caught together embracing on the platform below. Thoroughly enjoyable nonsense and, because they were all so good, difficult to pick out a star. More photographs can be viewed at flickr. Click here to download the programme for this production (pdf file, 188 KB).